Hi friend! I hope you’ve been having a beautiful week so far. I’ve been busy harvesting and storing all the fabulous rhubarb from my new garden patch, so I thought it fitting that I share a recipe that uses this bounty to create a delicious pie. Because who doesn’t love pie? When you switch to a whole foods way of eating, a lot of people think that you’re going to live a life of deprivation and definitely no more pie. However, with a little creativity in the kitchen you can actually create treats that are nutrient dense, won’t wreak havoc on your blood sugar, and still taste delicious! By making the crust out of nuts, seeds, and coconut flour you will end up with a protein, fat, and fibre-rich crust that tastes toasty and crispy, but that isn’t full of inflammatory grains. When you eat foods that are high in refined grains and flours, it can cause irritation and inflammation in the digestive system leading to leaky gut or an imbalance in pathogenic bacteria. These bacteria thrive off of the simple sugars, which are the byproduct of refined grain digestion, so by eating lots of fibre you can make sure you’re feeding the good guys. The blueberries and rhubarb in this pie also provide lots of antioxidants, which are great for combatting free radical damage in the body. Free radicals are created through natural metabolic functions and through interactions with various environmental chemicals. By eating foods that are rich in pigments, such as the red and blue/purple of these fruits, you can protect your cells from the inside out, while still indulging in some delicious treats. I recently hosted a Gluten-Free Baking class and this pie was a huge hit, so you can breathe easy knowing it has received the seal of approval from my fabulous guests. Enjoy! In a medium sized mixing bowl combine ground walnuts, almonds, and flax with coconut oil using your hands until a grainy, crumbly texture is achieved. Line a circular pie plate with coconut oil and press crust into shape all around the plate until even. Poke with a fork to prevent air bubbles during baking. Bake crust for 10 minutes until it golden brown. 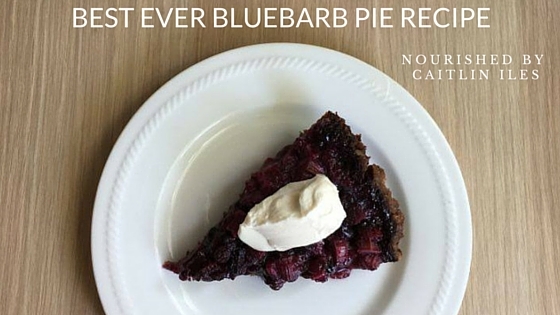 While crust is baking combine rhubarb, blueberries, tapioca, sweetener of choice, vanilla, and lemon juice in a bowl. Remove crust from oven and fill with berry mixture. Rip butter into small chunks and dot over the top of the berry mixture. You can sprinkle any leftover crust mixture on top of the berries for an extra crunch. Bake an additional 45 minutes or until rhubarb is softened. Well friend, that is our delicious recipe designed to use up the bounty of your rhubarb patch and pack a powerful antioxidant punch! If you’re looking for ways to up your antioxidants and get glowing skin this summer, make sure you download my FREE Sensational Summer Smoothies E-Book. Have a great day friend!